I love this game. A lot. My first impression of it wasn't too great, to be honest. I was mostly put off by its bad graphics, and the fact that it's a turn based game. I had never played something turn based before, but it sounded kinda boring to not have any time pressure. As you can see, it looks very simple and pixel-y. Nowadays, we've gotten so used to having very nice looking games. I'd say that for many people, gfx are more important than the actual game. I am guilty of this as well. 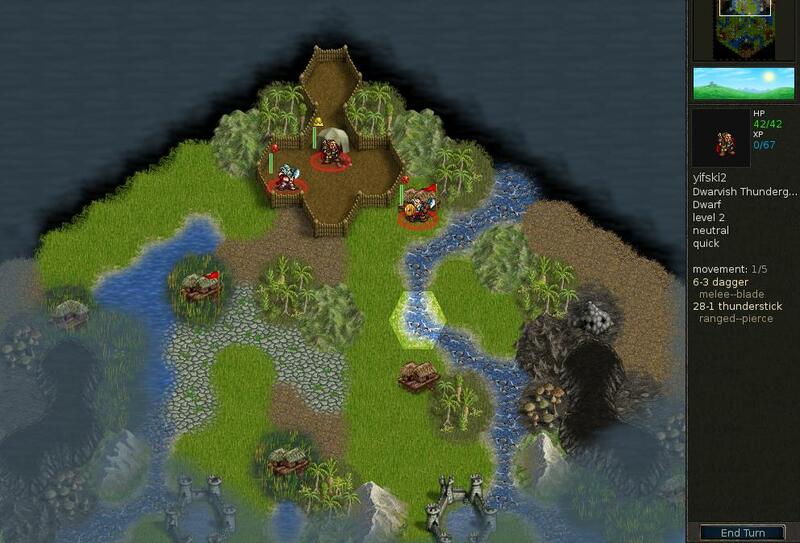 Wesnoth is a free turn-based strategy game, with a multiplayer and campaign. You can play with 6 different factions: the loyalists (humans), rebels (elves), northerners (orcs), undead, knalgan alliance (dwarfs) and drakes. The loyalists and knalgan alliance are lawful, which means that they get +25% damage when they attack during the day, and -25% when they attack at night. The undead and rebels are chaotic, which gives them +25% attack damage at night and -25% during the day. The rebels are neutral, so their attack damage doesn't vary with the day/night cycle. The drakes have two type of units: actual 'drakes', which are lawful, and saurians (small lizards), which are chaotic. The different factions all have unique units with different kinds of attacks. The terrain also has an effect on the units. For example, there are mermaids, they have a big advantage in water, but are very weak on the land. The dwarfs generally do better on the mountains. So it's important to chose a good position for your unit, because the terrain affects your chance of landing a hit. Mermaids only have 30% chance that their attack does damage on the land, but that increases to 60% in the water. Some units have draining abilities, they heal themselves for half the amount of damage that they inflict on an enemy unit. As far as I know, only the undead bats and wraiths have this ability. It can be very hard to kill them if you can't do any big damage. Other units can poison their opponents. Once it is poisoned, the enemy unit loses 8 hp every turn, until they are cured. However, poison can't kill an enemy unit, it will stop once working once the unit only has 1 hp left. Only the undead ghouls and orc assasins have this ability. There also are units that heal themselves, like the orc trolls and elvish wose trees, and units that heal and cure friendly units around them, like the elvish druid, the human mage, the saurian augur and the mermaid priestress. There are villages all over the map. If you capture them with a unit, they will give you 1 gold income every turn. Naturally, you also have to pay upkeep for all your units. If a unit is standing on a village, they will heal 8 hp every turn. 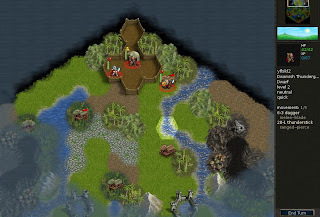 Villages are very important strategically, some players chose to capture as many villages as possible early in the game, so they can recruit extra units with the increased income. Units that move fast are very useful for this. Examples of fast units are the undead bats and ghosts, the dwarf gryphon riders (dwarves are very slow in general), the elvish scouts, the drake gliders etc. Units can level up, they gain 1 exp for every attack, and get a lot of exp for dealing the finishing blow to an enemy unit. When it levels up, the unit is fully healed and will be stronger. Usually, you can chose a specialization for your unit upon levelling up. There is many more that I could write about this game, but most importantly, it's very fun to play and although it looks simple, there is a lot of strategy involved. Also since it's turn based, you can play it while you're doing other things, there's no time pressure at all. :) So it's perfect for slow people that like to think things through. If you are interested in the game, read more about it on the official website.